Axios reported former White House counsel Don McGahn told a group of senior Republican Senate aides Trump uses a “hub and spokes model” — with no staff member empowered and Trump making all the decisions. On Friday, NBC News reported that at a Tuesday meeting of Trump’s top national security advisers at the White House, advisers discussed increasing military involvement at the border. Nielsen had refused to carry out Trump’s order to close the border, saying it was illegal. Trump told McAleenan to disregard Nielsen’s concern. Two days later she resigned. Trump has been eager to stop immigration. Baker told lawmakers there was widespread concern inside the FBI that Trump had attempted to obstruct the investigation into his campaign’s links to Russians when he fired former FBI director James Comey. Baker testified he was told by former Deputy FBI Director Andrew McCabe that deputy attorney general Rod Rosenstein told McCabe two members of Trump’s cabinet had endorsed the notion of invoking the 25th Amendment to remove Trump from office. Baker also said last October that he not did think Rosenstein was joking about wearing a wire or invoking the 25th Amendment — but that he did not connect the two discussions. On Thursday Trump retweeted a video from Fox Business host Lou Dobbs claiming his approval was up to 55%, tweeting “Great news! #MAGA.” His actual approval was 43% — the 55% was actually Trump’s disapproval number. The new stance would exempt Trump’s hotels, including Trump Hotel DC. The DOJ shift started in June 2017, and now closely parallels arguments made in a January 2017 by Trump Organization lawyer Sheri Dillon. On Friday, prosecutors indicted Yujing Zhang, who was arrested on the ground of Mar-a-Lago, on charges of lying to a federal officer and entering restricted grounds, but did not include espionage charges. The Miami Herald reported a source claims Zhang knew before leaving China that the function she claimed she was attending had been canceled. Zhang will likely move to a detention facility and be scheduled for deportation. On Saturday, in a letter, Rep. Neal gave the IRS a deadline of April 23 to turn over Trump’s tax returns, threatening otherwise to bring the dispute into federal court. 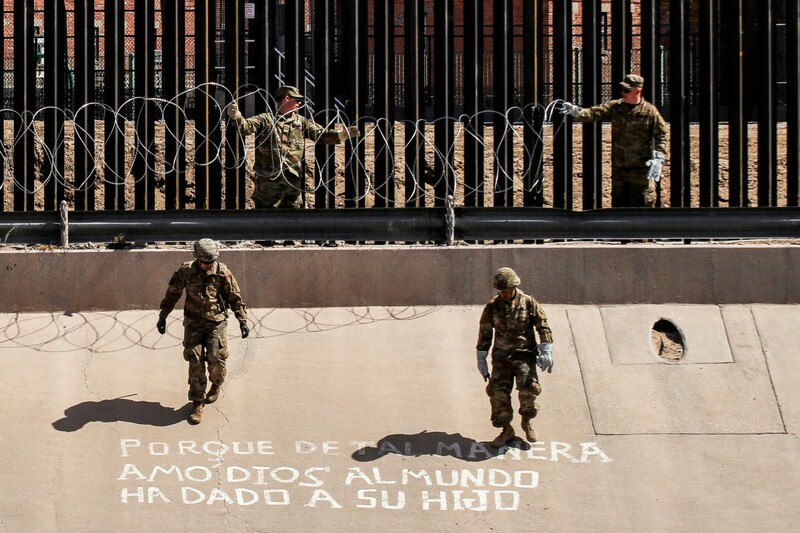 U.S. soldiers install barb wire by the US-Mexico border fence reading ‘Because in such way God has loved the world he has given his son’ in El Paso, Texas state, US, as seen from Ciudad Juarez, Chihuahua state, Mexico.